ALL INTERNATIONAL ORDERS RECEIVE 10% OFF AUTOMATICALLY AT CHECKOUT. 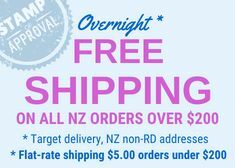 ALL PRICES ON THIS WEBSITE ARE CURRENTLY IN NZD. To find out the rough cost in your own home currency use google to convert prices to your currency, then deduct 10% - that will be your approximate cost. We invite you to compare and also factor in our low flat-rate shipping options.